Want to follow in Warren Buffett's investing footprints? 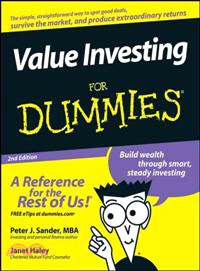 Value Investing For Dummies, 2nd Edition, explains what value investing is and how to incorporate it into your overall investment strategy. It presents a simple, straightforward way to apply proven investment principles, spot good deals, and produce extraordinary returns. Complete with helpful lists of the telltale signs of value and "unvalue," as well as the habits of highly successful value investors, Value Investing For Dummies, 2nd Edition, could be the smartest investment you'll ever make! Peter J. Sander is a professional author, researcher, and investor living in Granite Bay, California. His 15 personal finance and location reference book titles include The 250 Personal Finance Questions Everybody Should Ask, Everything Personal Finance, and the Frommer's Cities Ranked & Rated series. He has developed over 150 columns for MarketWatch and TheStreet.com. His education includes an MBA from Indiana University, he has completed Certified Financial Planner (CFP) education and testing requirements, and his experience includes 20 years as a marketing program manager for a Fortune 50 technology firm and over 40 years of active investing. Janet Haley CFP, CMFC is a securities industry professional and has a bachelor's degree in international business and political science from Marymount College. Part I: The What and Why of Value Investing. Chapter 1: An Investor’s Guide to Value Investing. Chapter 2: How Value Investors View the Markets — and Vice Versa. Chapter 3: The Value Investing Story. Part II: Fundamentals for Fundamentalists. Chapter 4: A Painless Course in Value Investing Math. Chapter 5: A Guide to Value Investing Resources. Chapter 6: Statements of Fact Part 1: Understanding Financial Statements. Chapter 7: Statements of Fact Part 2: The Balance Sheet. Chapter 8: Statements of Fact Part 3: Earnings and Cash Flow Statements. Chapter 9: Games Companies Play: Irrational Exuberance in the Financial Statements. Chapter 10: On Your Ratio Dial: Using Ratios to Understand Financial Statements. Part III: So You Wanna Buy a Business? Chapter 11: Appraising a Business. Chapter 12: Running the Numbers: Intrinsic Value. Chapter 13: Running the Numbers: Strategic Financials. Chapter 14: Beyond the Numbers: Strategic Intangibles. Chapter 16: Shopping for Value: Deciding When the Price Is Right. Part IV: Becoming a Value Investor. Chapter 17: Special Packages: Funds, REITs, and ETFs for Value Investors. Chapter 18: Shopping for Value: A Practical Approach. Chapter 19: Ten Signs of Value. Chapter 20: Ten Signs of Unvalue. Chapter 21: Ten Habits of Highly Successful Value Investors.